Many types of pests can plague poplar plantations. Fortunately, leaf-eating insects such as moths, weevils, and bugs are present in AHB’s bioenergy demonstration sites but are not posing serious problems. None of the sites have required a chemical application to manage pest populations. 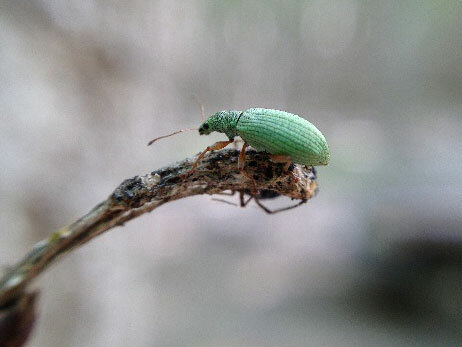 Monitoring for pests is an important research component for the four poplar bioenergy demonstration sites managed by GreenWood Resources, Inc (GWR). Insects can seriously damage trees by sucking or piercing plant tissue which reduces a plant’s ability to gather, store, and utilize sugars and nutrients. Monitoring for potential pests has included pheromone monitoring for insects, year-end assessment of boring insects, and frequent site visits to determine the common leaf-eating insects at all sites. 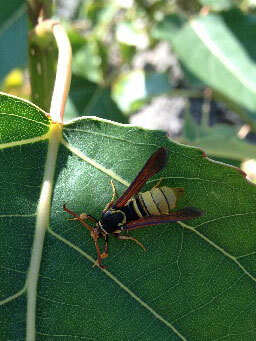 Western Poplar Clearwing Moths (WPCM) (Paranthrene robiniae) (Figure 1) have been present at the Clarksburg, CA and Hayden, ID demonstration sites. The Clarksburg site had the largest population and a survey revealed that a high percentage of trees experienced a WPCM attack in 2014. If needed, a management strategy utilizing mating disruption/confusion can be implemented, which is currently being practiced at GWR Boardman Tree Farm with great success. WPCM larval damage is characterized by a small amount of wood shavings (resembling sand grains) and is commonly found near the base of branches on the main trunk of the tree. We expect that the November 2014 harvest of the Clarksburg site will lead to a high mortality rate of larvae in the harvested trees. However, because this pest is present in the surrounding area, we suspect WPCM pest populations in 2015 will mirror those in 2014 regardless of the larval mortality due to harvest. 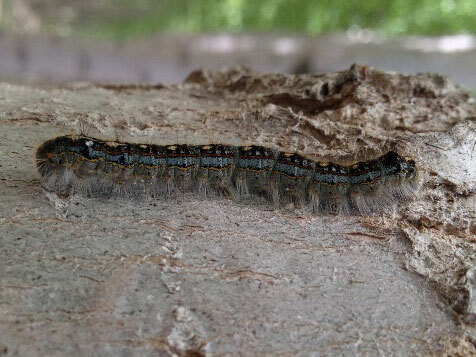 Figure 3 (right): Forest tent caterpillar (Lasiocampidae: Malacosoma sp.). Lace bugs (Tingidae) are present at the Jefferson, OR demonstration site. Damage from this pest is most commonly found on the underside of leaves, which give the top of the leaf a bronzed look. (Figures 4 and 5) Currently, this minor infestation seems to be marginally reducing the photosynthetic capability of the tree. There is potential for this insect to vector diseases, but there is no indication that this has occurred at this time. 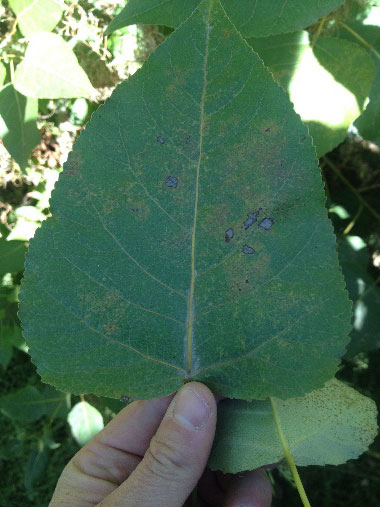 Figure 4 (left): Lace bug adults on the underside of a poplar leaf at Jefferson, OR. 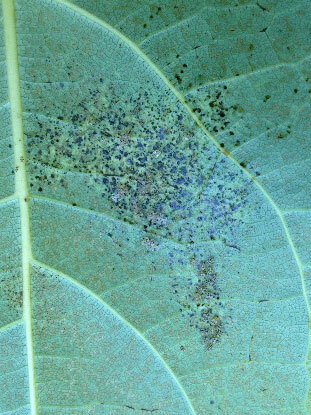 Figure 5 (right): Bronzed appearance on the top of a poplar leaf from lace bug damage. GreenWood Resources will continue to monitor pest activity at the four demonstration sites. The information will provide potential growers with the knowledge and tools needed to successfully counter the impact of defoliating and damaging pests in hybrid poplar bioenergy tree farms in the future.